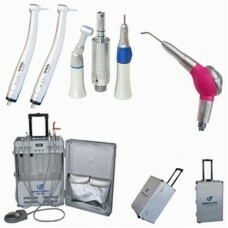 The units that cause dental materials, such as composites, sealants, and cements, to set or polymerize in the mouth. These units produce a visible blue light that these materials absorb, causing them to set. Every dental curing light today is a visible blue light and does not produce ultraviolet light, which would not generally be safe for you, or the patient. So these lights are not UV lights. The confusion arises from the fact that dental curing lights once were UV lights. The inventor of this system was not familiar with visible light curing chemistry at the time, and therefore selected UV chemistry, which was quickly replaced by blue, visible light curing chemistry. Today we have two different kind of curing lights, those that are halogen (bulb) lights and those that are LED (light emitting diode). The LED lights do not themselves produce heat, unlike the older bulb lights that come with cooling fans. This unit unlike an LED can get really, and I mean really hot. Some of the current high powered lights are recommended to cure a material within one second. These lights put out a tremendous power (4000 mW/cm2) compared to typical lights that emit either 600 or 1200 mW/cm2 and are recommended to cure a material within 20 seconds. The big difference between these high powered units and the typical units is that the material is forced to set all at once with no heat dissipation during the curing time. This amount of heat build up is sufficient to cause skin burns and tissue damage. Several clinicians and researchers speak of how the material reacts to this instant cure, whether the material has internal stresses built-up, or not, and whether a ramping up of curing is preferred to reduce these "internal" stresses. There is some disagreement about this. However, I think this misses the point that it should be the heat build-up in the tooth and surrounding tissue that we should be of most concern. Remember that when we cure dental materials that the patient is often anesthetized and can not feel this heat. My recommendation is to avoid the ultra high powered lights that promise to cure something in 1 to 3 seconds. Take a little more time, or at least move such a high powered light further back off the tooth and then slowly bring the light closer to your normal curing distance. This will avoid another possible source of post operative sensitivity. The office of the dentist Hermosa Beach operates in such a professional manner. They are always on time! You can tell that the whole staff really enjoys their job and truly cares for the patients.